On Friday, February 17, the Metrolinx Board will consider yet another update in the long-running saga of its attempt to develop an integrated regional fare policy. It is no secret that for a very long time, Metrolinx staff have preferred a fare-by-distance system in which riders pay based on the distance travelled, possibly at different rates depending on the class of service with fast GO trains at the top of the pile. The latest update tells us almost nothing about the progress their studies, but does reveal that a fourth option has been added to the mix. Option 1, modifying the existing structure, simply adds discounts to smooth the rough edges off of the existing zones between service providers. This has already been implemented for GO Transit “co-fares” with systems in the 905, but it is notably absent for trips to and from the TTC. Riders face a full new fare to transfer between a TTC route and GO or any of the local 905 services. Option 2, a more finely grained zone structure than exists today, would provide a rough version of fare-by-distance, but would still have step increments in fares at boundaries. Note that this scheme also contemplates a different tariff for “rapid transit”. Option 3 is a “Hybrid” mix of flat fares for local services and fare-by-distance for “rapid transit” and “regional” services for trips beyond a certain length. The intent is to charge a premium for faster and longer trips on services that are considered “premium”. Option 4 is new, and it eliminates the “flat” section of the Hybrid scheme so that the charge for a trip begins to rise from its origin and there is no such thing as a “short” trip at a flat rate. The rate of increase would vary depending on the class of service. Ever since Metrolinx began to treat “rapid transit” as a separate fare class, this created an inevitable conflict with the Toronto transit network’s design as an integrated set of routes where subways provide the spine. Riders are not penalized with a separate fare for using the subway because it was built to replace and improve on surface streetcar and bus operations. This is fundamentally different from GO Transit which replaced no significant existing transit services in its corridors, and which was designed as a high speed operation to attract commuters out of their cars. A basic flaw in much work on fare integration has been the assumption of a zero-sum situation where any fare reductions created to reduce or eliminate system boundaries would have to be offset by higher revenue from some other group of riders. In Metrolinx’ view, the available target was the Toronto subway rider, and this would be justified by thinking of the subway as a separate class of transit service. That scheme has run into political headwinds, and even the Metrolinx Chair has stated at a board meeting that a zero-sum scheme is not workable. The problem lies with funding limitations at Queen’s Park. GO Transit is desperate to preserve its revenue base by treating its service as a premium class under the rubrics of “rapid transit” and “regional” service. When this distinction was first proposed, Metrolinx planners only considered GO Transit and the TTC subway as candidates even though other forms of “rapid transit” – LRT and BRT lines – are under construction or operating. This becomes even trickier when one considers a line like Eglinton Crosstown that will be underground in part, but much of the line will operate at grade. Is an all-surface corridor like the Hurontario or Hamilton LRT lines a “local” service or a “rapid transit” line? For bus operations, there are routes operating on BRT corridors, but they do not spend their entire time in exclusive lanes. At what point does a service become “rapid transit” and therefore warrant a higher fare tier? If a route operates with GO buses, should it be “regional” and charge more, but if by one of the 905 operators, be “local” and charge less? 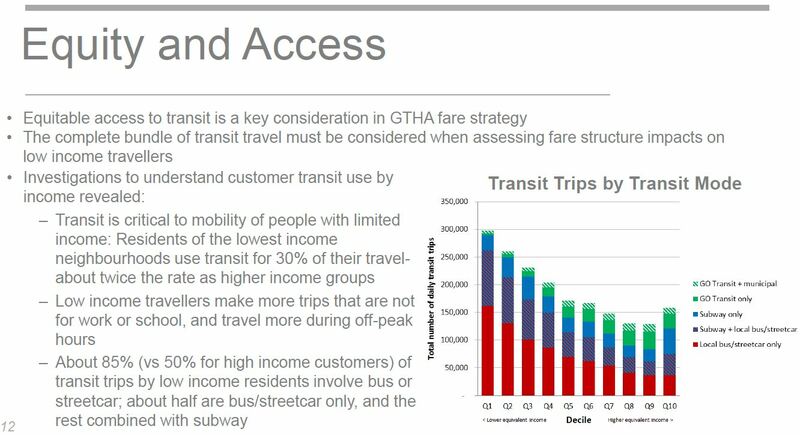 There is wide recognition in the GTHA that transit cannot work without more exclusivity and priority, but will planning be coloured by the potential fare implications of two classes of service? Will Scarborough Subway boosters be so happy with their new line if the ride to downtown costs substantially more than a “regular” TTC fare? That concept of a “regular” fare links with another transit boondoggle, John Tory’s SmartTrack scheme. Although this has dwindled from dedicated, frequent service to the provision of additional stations on the GO network, there remains the concept that riders within Toronto would pay a “TTC” fare to ride a GO/SmartTrack train. The sophistry lies in the question of just what a “TTC” fare will look like by the time the new SmartTrack service operates. If Metrolinx gets its way, “rapid transit” fares on the TTC will behave a lot more like GO Transit that they do today. Ridership projections for new subway lines and for SmartTrack depend on that relatively cheap, flat TTC fare in determining how riders will be attracted. If the fare structure changes significantly, so will the projected demand for these services. Every iteration of new fare proposals has brought the most basic question for riders: what would the new fares mean for me? Metrolinx is silent on this issue, and so there is no basis for comparison or evaluation. All we have is a few generic charts. Considering that this project has been underway for two years (with less formal discussions going back years before that), the need to propose actual values for a tariff and evaluate their impacts on rider costs and system revenues is long overdue. But this would also move the debate from a convenient, friendly academic discussion of principles to the bare-knuckle political arena. Metrolinx provides a sample of fare structures world-wide to establish that Toronto would hardly be unique in changing its tariff. Leaving aside the geographic challenges facing their map-maker, and the fact that this information is hardly “confidential” as the slide is labelled, all that this map really shows is that there is a variety of fare systems. One critical point missing from this review is a discussion of subsidy levels, and the degree to which zones or distance-based fares represent a significant barrier to transit use in each city. Moreover, Metrolinx planners completely ignore the role of passes or any equivalent form of bulk purchase for transit services. A city or region may have “fare by distance”, but this may be offset by pass options that render transit costs essentially flat within some part of the network. In Toronto, over half of all transit trips are made using a Metropass, and riders pay a fixed cost per month for unlimited riding. A variation on prepaid passes is fare capping where usage of the system beyond a certain level does not incur added cost on a daily, weekly or monthly basis. This is already in effect on GO Transit, and has been proposed by the TTC as the method of implementing a “Day Pass” function on Presto. The most common web page anyone inquiring about visiting foreign cities will encounter will be one extolling the virtues of transit passes to simplify and limit the cost of getting around. Another variant is the time-based fare where the concept of “transfers” as used by the TTC disappears, and a single fare buys unlimited riding for a set period of time. This is already in effect in parts of the GTA, but notably not for the Toronto system. The concept was rejected by the TTC in its 2016 budget discussions because of its cost. Indeed, the TTC has even floated the idea of eliminating fare discounts for seniors and students to address its budget shortfalls. Metrolinx considers time-based fares as a local decision, and yet they are designing a fare structure for the entire region. Their selective consideration of distance-based fares shows the built-in bias of their studies. It is important to remember that all of this upheaval and desire for an “integrated” fare structure is intended to serve a minority of transit riders. Metrolinx observes that 55,000 riders are now affected by a double fare, although this number will grow. Should we tear apart the fare system now used by nearly two million daily riders? There are actually two barriers to transit use: fares and service. Travel around the GTHA over significant distance, especially crossing system boundaries, can be tedious with infrequent bus routes and poor connections, not to mention fare barriers where they exist. But the real sophistry in this slide comes in the observation that travellers expect fare values to reflect the value of their trip. This can be read as a justification for charging more to ride “better” services, but to riders the real meaning is “I should not pay a fortune to ride a short distance”. Any discussion of fares, like taxes, is founded on the premise that “I” am paying unfairly to subsidize others who don’t deserve it. “Riders should pay for what they use” is a simplistic phrase, but it ignores many factors underlying transit costs. Subways are very expensive to operate (never mind to build), and a large portion of the cost is fixed whether someone rides the trains or not. Extending the subway to Vaughan will add $30 million to the TTC’s operating costs in 2018 net of new fare revenue. Who should pay this cost – all transit riders, subway riders, only riders on the extension, or governments as a matter of economic development and improved mobility? 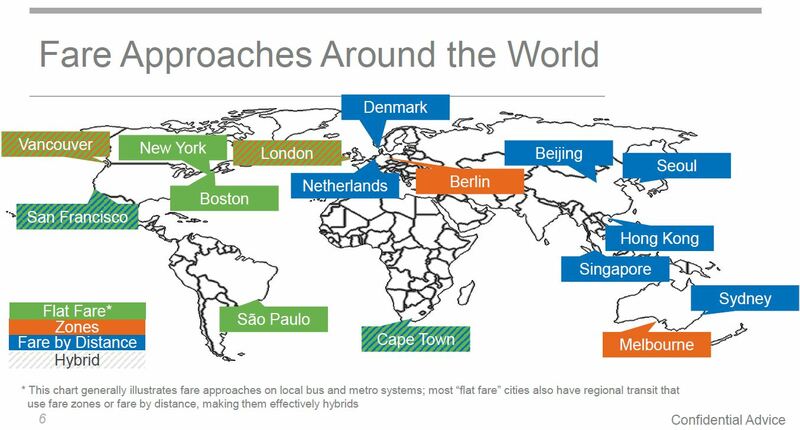 Transit capacity necessarily exists at many times and locations where it is not fully used. That is the nature of a network. A train may leave Union Station packed to the roof, but be nearly empty when it reaches its outer terminus, and it will run nearly empty on a return trip. A guaranteed 30 or 15 minute headway might exist as a matter of convenience to encourage the sense that transit is “always available”. Local transit routes work the same way. Many trips will not be fully loaded. Should we charge more for them? If the TTC provides a guaranteed service level on a “ten minute network”, should it charge a higher fare? Some routes are best served by a mixture of express services to handle long trips with local services to handle shorter ones. This is not a matter of pampering “express” riders but of optimizing the provision of service. 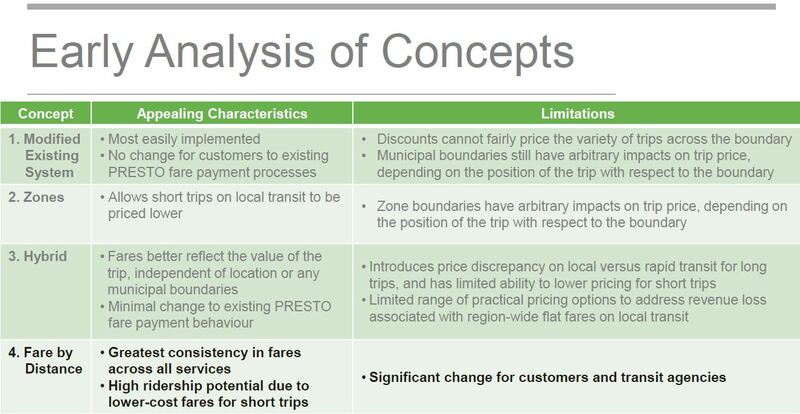 At this point, Metrolinx’ analysis of fare options shows that each has its benefits and challenges. In an era where our “regional” transit agency, Metrolinx, is burdened by the challenge of creating a network to move people over long distances, it is ironic that their fare proposals show a “high ridership potential” for cheaper short trips. As someone who lives downtown and typically rides less than 10km to any destination, cheaper fares sound just great, but I already enjoy them thanks to my Metropass and the senior’s discount. The real question for Metrolinx is the effect of a new fare structure on people whose trips are necessarily much longer because they live far from their regular destinations. Metrolinx attempts to mute criticism by an appeal to “equity” in transit fares. Most of “the poor” do not live in subway neighbourhoods, and their local trips will necessarily be on surface routes. It is unclear how their fares and service would be affected in a future network with more “rapid transit” serving these areas. The more affluent who live in the 905 but commute to the core likely have a car and use it for short trips because there is no transit alternative. Their commuting costs are substantial, but are competitive by transit on a total cost and time basis compared to driving. Riders who take short trips will use a pass if they can fit this into their available finances, but the barriers are considerable when future transit usage is unpredictable. Toronto plans to implement a fare mechanism to offset this problem over coming years for those who meet low-income criteria, but the benefits to the working poor may be limited. 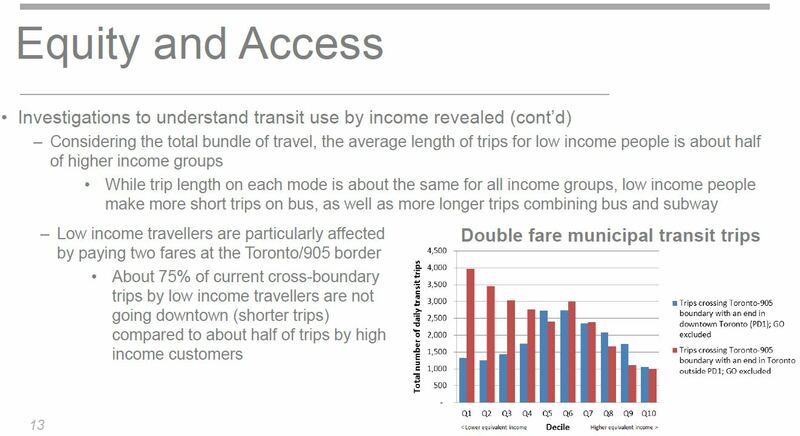 Low income travellers are “particularly affected” by the 416/905 boundary for the simple reason that higher income commuters are either in their cars or on GO Transit which they can afford. The poor are stuck with local bus systems that actually provide transit to locations other than downtown, albeit not very well. Businesses dependent on cheap labour encounter problems attracting workers who cannot afford the time or the cost of cross-boundary trips. If the transit network changes to address the problem of transit quality and capacity for travel that is not peak period, core oriented, the travel market will change. Metrolinx should not base its fare policies or assumptions of who will be affected on current travel patterns, but on their hoped-for future network. Building in a disincentive to longer “local” trips, let alone “rapid transit” could well work against the very goals Metrolinx claims to pursue. A special word is needed here about riders within Toronto. In all of the debates over suburban transit expansion, regardless of where one might stand on the merits of each proposal, there is a common complaint: suburban riders are economically constrained to live far away from the best part of the transit network, and they must travel long distances to reach workplaces and schools. Any claim that a fare by distance system will benefit the less well off because they primarily make short trips completely ignores the effect on those riders who have no choice but to make long journeys. 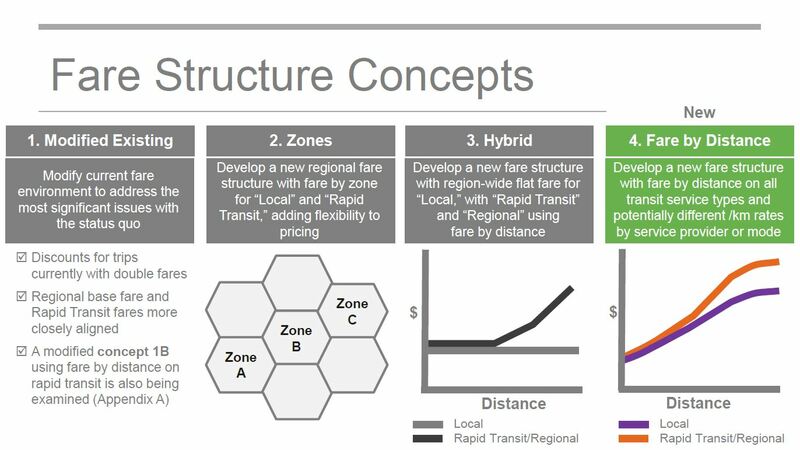 Metrolinx planners owe everyone much more detail about how each of their fare systems would work including examples of tariffs and zone boundaries. How sensitive are comparisons between schemes to changes in local versus “rapid transit” fares? What are the implications for future travel as the GTHA network evolves? Will a new fare scheme make transit better, or simply shuffle the fare revenue between groups of users to address the annoyance of a fare boundary? If there is to be a new system, should its effects be revenue-neutral, a zero-sum game where one group wins and another loses, or should a “better” fare system be accompanied by better subsidies? What tariffs would be possible and how much would they cost? At what point are fare subsidies counter-productive if they detract from funding for better service? These are vital questions for the future of southern Ontario’s transit network, but none of the work to date has addressed them. The real issue for transit is not to redistribute fares, but to encourage transit riding, increase network capacity and provide a real alternative to driving. This is a social issue (availability and perceived cost of time) and an economic one (mobility provides access to workplaces, schools, entertainment and services). Twiddling with the fare system does not provide one more seat on the subway or a faster ride. Only a commitment to better transit funding for capital and operating costs can achieve this. ← Transit First For King Street? Based on this criticism, as written by the Toronto Sun, tracking one’s location means they would be against fare-by-distance. If one wants fare-by-distance, tracking is needed. True fare by distance seems like it would require a lot more than just a tweak to the Presto software. The existing transit lines aren’t designed to fit that model. How would Metrolinx handle the customers flooding onto GO/UPX trains because the price to Union is the same and it’s way faster? What about all the times that the most direct route isn’t actually the fastest, for example when diverting a little to take a subway or GO train will be faster than a bus or streetcar? And will we punish riders for times when a direct route is simply not available, particularly in the 905 where non-grid based routes are more prevalent? Between the politics and the infrastructure challenges, I don’t see how we end up anywhere but Modified Existing. Sometimes there are reasons other than wealth for taking Transit. I take Transit from Bramalea City Center to downtown Toronto quite frequently, not because of the cost, but because I do not like to drive in traffic. As for cost, GO is twice as expensive compared to Brampton + TTC fare, but it is only faster if you are going to downtown. As for a Transit trip to downtown Toronto, the Bramalea City Center to York University part taken on 501A Brampton bus is faster than the shorter TTC 196 bus + subway from York University to downtown. The subway is fast compared to surface traffic, but is not really fast. I suspect Scarborough riders may find this out when they have a chance to compare it to the RT. Particularly if half the Bloor-Danforth subway trains are turned back at Kennedy (As I expect they will). Steve: Current fleet plans include only enough trains to send half of the service beyond Kennedy to STC. Further to Wklis’ comments on Sun … yes, fare by distance requires ‘tracking’ but so does the whole PRESTO system. Your recent (30 days?) travel history is on your card. Of course, the locations noted are not always where one was but …. If you want to travel anonymously you obviously should not register your PRESTO card, or should use the proposed, temporary ones. Steve: Sort of like “burner” phones. We will become a city of drug dealers and spies hiding our every move. So I decided to look at a fare-by-distance scheme, and chose Sydney. Turns out it’s a fare-by-zone for buses, with three bands. Anything 8km and over is basically a flat fare of $5.40 (or less, depending on media and concessions). Not exactly what I think of fare-by-distance, but I guess that’s a matter of interpretation. (How those kilometres are calculated, I am not going to try to figure out. The website tells us that the correct fare [of course!]) is deducted automatically, and it directs us to the trip planner to find out the exact amount. So there’s that: Metrolinx playing fast and loose with their ‘research’. Next, I wonder if anyone in planning has talked to the Executive Vice-President of Presto about whether and how this can be handled technically. It’s my impression that over 95% of GO train riders use the “default trip” option on their Presto card, which means they tap to get on (without pushing the “override” button) and don’t have to tap getting off. I wonder if Metrolinx or Presto have any stats on the % of trips that are currently are “default trips”. What I am pretty sure is that the default trip concept won’t work for many transit riders. I would not want to set a default trip on the TTC myself. Doing so, I might run the risk of either forgetting or changing my mind on the routing, and being found out by fare inspectors. In fact, I would assume that the “default trip” concept likely won’t work for the 50% of TTC riders who currently use a Metropass. I assume that Metropass users 1) use the system a lot, so more than just the exact same trip to work and mirror return every day; and 2) take advantage of the flexibility of being able to hop on and off as appropriate. Therefore, with any fare that isn’t a plain old flat or time-based fare, it’s going to be “tap on, tap off”, wherever you board or embark from a transit vehicle. Maybe it can be avoided at subway interchanges — can you imagine the mess if everyone had to tap off the Bloor line and tap onto the Yonge line in morning rush hour? But, you’re gonna have to tap. And don’t forget to tap off when you leave the final vehicle, or you’ll be charged for a trip to Niagara Falls or Kitchener. Steve: One tiny consolation is that you only would have to tap off when you leave the rapid transit network. For example, on at Broadview, off at King, but then any sane person would use the streetcar because it’s more comfortable and would cost less, assuming it showed up. And this all doesn’t even consider whether fare-by-distance makes sense in a system (the TTC) which is set up on a grid and transfer system (just as Jarrett Walker recommends) which means there usually are multiple choices for getting from Point A to Point B. Fare-by-distance can be sensibly implemented when the majority of trips are one-seat rides, but that’s not what we’re dealing with. Steve: The combined arrogance of the TTC and Metrolinx makes any reasonable fare implementation quite a challenge. As mentioned previously, the GPS part of the readers needs to be vastly improved if fare by distance is to work with the TTC vehicles. Got on a 97 southbound near Glencairn the other day and Presto marked the tap as being at Wilson Station (at the correct time). The biggest risk in a massive fare change is that it doesn’t work as expected, and the system can’t be modified to deal with it (ie. not enough surplus buses, or surplus operational funding or data collection in place to know what is happening). This sort of problem could have spill over into the economy if people can’t get to work, or if they have to spend a wildly different amount of money or time to get to work (due to switching to car, or being unable to use a route because of capacity issues). Like the imbalance between residential and business property taxes any massive changes to the transit fare system should be phased in gradually in such a way that people can be prepared for them, and so the systems have time to manage the changes…we’ve even seen capacity issues with Presto for scanning…if overnight everyone has to scan on and off, there is going to be big issues, better to slowly phase in these changes (both technical and financial). This is all complicated by systems that are wildly different already…so GO’s first goal should be to standardize the fare systems for all systems with the minimum amount of change possible…what this looks like is likely merging one or two fare systems together at a time…for example Mississauga and Oakville…and then slowly adding to that system, until just 905 and 416 are left. The challenge of merging two fare systems is a much simpler issue to deal with, and monitor for issues…on a two or three year per merger system, with two or three in progress at a time, it would take ~10 years to complete and get to one system. I’m trying to understand why Metrolinx staff felt the need to pry into this discussion something that even their own board has indicated is a non-starter politically both provincially and within the city. Part of me feels this has only been brought forward to create enough controversy so that option #3 is chosen. The “Well, you know, things could have been worse” approach. Of course, Metrolinx could just give the TTC $20M (claimed) a year to implement 2 hr timed transfers. That’ll effectively cut the cost of a short trip in half. I use Miway and Brampton Transit fairly regularly, and I was able to get in 3-4 trip easily in a 2 hour window. I can imagine how many short trips one can get in using the TTC. Steve: Toronto could just as easily treat the two hour fare as a contribution to their Poverty Reduction Strategy, although obviously like any across the board discount, it would benefit everyone. This has the advantage of avoiding all of the rigamarole of a means test and control on who gets what sort of discount. The bean counters only see “lost” revenue, not the savings through simplification. Stefan Novakovic:: The highway flows smooth and gentle as a river, sleek cars moving in sync; passengers are reading, elegantly sipping coffee, speaking face to face, or tapping away on the next-next generation of phones. Outside, a hazy panorama of vaguely futuristic towers hangs in the background. For good measure, it’s also a flawlessly sunny day, without even a hint of a cloud in sight. No more accidents, no more pedestrian fatalities, no more road rage, and no more time lost to rubbernecking and reckless driving. No more traffic jams. I think that the province and the federal government should reconsider directing tens of billions of dollars from conventional transit to self-driving cars based transit as the technology already exists as writes Stefan Novakovic. Steve: As the article you cite notes, the situation is far more complicated and less likely than the advocates of self-driving cars would have us believe. However, anywhere there is a technology looking for investment, governments will line up to shovel money out the door. Just ask Bombardier. There is a pernicious thread in the anti-transit literature on the political right that says self-driving vehicles will make transit obsolete, and this is used to justify funding cutbacks if not outright abandonment of transit. In the same way that charging a toll for motorways should, in my opinion, come with a reasonable public transit alternative, charging a premium fare for ‘rapid transit’ routes should mean that a transit user should also be given the choice to avoid this fare surcharge via non rapid transit routes. For example, it is my understanding that in places like London one can forgo the metro and take buses if they prefer as bus routes run at a reasonable frequency. However in Toronto, the practice has been to decrease bus service and delete routes when a rapid transit line opens (ostensibly to save money and avoid service duplication.) But if users are charged extra to use the subway as a premium service, shouldn’t there be a requisite increase in bus service? Discussions about “What fare is fair”, “who can afford to pay, and who should get discounts”, and “how cheap can we make it” will all never end, and will divert us from making informed choices. First – resolve the issue of government subsidies. If we make it a percentage of operating and capital costs, have that discussion and get it resolved. The issue of federal, provincial or municipal will always be a mess. My opinion is to keep the feds out of it, as they have to deal Canada wide, and asking how many Albertan taxpayer dollars should go to Toronto is a mess that will never be solved. Municipal taxpayers are a problem because the urban area does not follow the borderlines on a map. So asking Toronto taxpayers whether they would prefer to fund the Gardiner & DVP costs through their taxes, or from road tolls paid by “those 905-ers” is also a political mess. The provincial government would be the appropriate choice as to the funding source for tax subsidies. Second – once subsidies are known, you can calculate the overall dollars required, and find a way to charge fares that cover those costs. Keep the fares as simple as possible, and if groups need assistance, create a process that keeps the transit agency whole. I get tax credits for buying Metropasses. Low income people or seniors could get financial support as well. Don’t make the bus drivers responsible for verifying one’s age or social status. Let them focus on driving safely and on time. Third – keep it simple and predictable. Regardless of income level, people want to know in advance what the cost will be, and are nervous if some technical glitch will cost money. A monthly pass is a good example. I know the monthly cost, and if I remember to bring it, my transit is very easy. A cost per week, cost per day, or a cost per trip are easy to memorize. The cost based on distance travelled can be more confusing. When taking a taxi, the fare meter shows you the costs you owe, but unless technology improves, I do not see the ability to implement that option on a system that handles 1.5 million rides per day. Fourth – perception of fairness. When people feel that some people have an advantage over others, there is never any customer satisfaction. Integrating GO Transit and TTC pricing makes some sense, so that my TTC ride costs only $3.25 while my GO ride costs $7.50 for the same ride. People wonder why? And then they say GO prices give free parking while TTC charges to park. Our heads start spinning with numbers, and we get frustrated. Fifth – set a structure that retains passengers, and provides predictable revenues. The monthly flat rate pass system gives customers an incentive to continue to use the system. The occasional riders may want single ride fares, but if they pay a higher price for a single ride, that is normal. Most smart businesses have pricing structures where loyal customers are rewarded for their loyalty. These are, in my opinion, the factors that are relevant when trying to get an integrated fare system across an urban area like the GTA. There will be no perfect solution, the one that benefits all riders and does not inconvenience anyone. And yet, the double fare issue needs to be addressed. Full fare-by-distance seems to be too complex to implement. It looks like a Zones model, or Overlapping Zones model, would be the easiest solution. That would allow all of 416 to remain in one “zone”, thus avoiding the need for massive changes in the TTC’s fare collection infrastructure. While the short cross-boundary trips would no longer require double fare. Steve: What is so ridiculous in all of this is that the short cross boundary trips appear to be the main thing Metrolinx cares about. What is the cost if the provincial government wants to get rid of this, to just get rid of it…basically track it, but don’t charge it…so still have the double tap or whatever, but have the province cover the difference (whatever it is)….lets just do that and get this issue resolved. Steve: This is an intriguing question, and it came up indirectly in the Metrolinx Board meeting. The point was raised that we spend billions on infrastructure as an “investment”, when much less money spent on operating costs would have a better return. It’s something, finally, Metrolinx planners seem to be looking at. 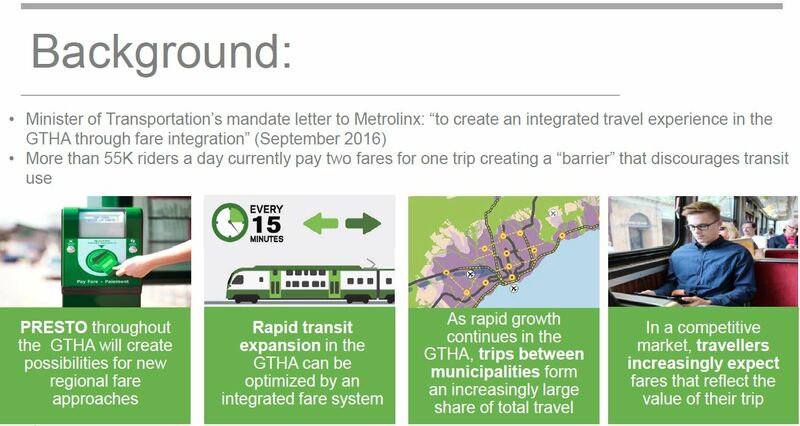 It’s apparent why Metrolinx is fixated with cross-boundary fare integration — isn’t regional integration a core element of their mandate? With a different mandate might come a different outlook or solution. The recent news coverage on this seemed to again fixate on the potential for shorter trips to cost less than longer trips without providing any details about how it would actually affect riders or what the impact on fares and ridership would be (let alone implementation details about how this would be calculated or tracked). The public reaction seems to be favourable, thinking that riders might pay what they do now for a moderate to longer trip but would get a discount on a short trip. But if anything, the slides in your first follow-up article seem to imply that it would be the opposite — that the current fare would cover a distance of 7 km or so, and beyond that distance you would pay a higher fare. Metrolinx really needs to start providing details about how fares would be affected by their various proposals so that the public would be informed. It’s fine to discuss concepts in general terms at the start of the study, but I am afraid that they will impose a decision without having given the public, agencies or municipal governments an idea of what the change means in real terms. I’m impressed by a lot of well-thought out replies, in addition to Steve’s insights in deconstructing Metrolinx’s motivations, that ignore simple “flat hybrid—2-hr time-based transfer” and promote a far more complex & confusing universal fare-by-distance for all trips & modes on GO/RER/LocalPublicTransit—to hell with TTC’s long history building rides to 2nd highest in Cda/USA, only New York’s MTA is higher (no surprise given large, dense population, esp. Manhattan. When I joined TTC as its CMO Jan.15.1997, I had my forecasting head, Jim Rubin prepare a historical ride chart for me to help teach me the dynamics of rides (fares, strikes, service, expansion, etc.) I kept telling him to go back further, and was finally satisfied when he got to 1940. There was 1 fare zone during WWII: limited car production, gas rationing, with women doing non-traditional jobs; until 1952 when ~5 (GTA) fare zones introduced that led to 10 yr TTC ride decline (end gas rationing, soldier came home, car production resumed and baby-boom produced a bulge (that Steve & I are early members of! )—despite the opening of the Union/Eg subway 1954. The mistake was mostly corrected in 1962 move to 2 fare zones, just in time for baby-boom to enter its 13-24 yo heavy use of public transit that fueled ride growth (along with continued subway expansion, surface service increases… until 1 fare zone introduced in 1973. NB TTC was operating revenue positive (no op deficit) until 1971 with an all-private citizen Commission, with an all politician commission starting in1973…the dawn of the begging for $ hat in hand dependency (save during CGM David Gunn’s remarkable tenure: Jan 1995–April 1999. Steve: The 5 zone system corresponded to (a) the consolidation of Metro and the expansion of the TTC beyond the old City of Toronto, (b) the rise of auto travel after WW II. You cannot link the zones to the ridership fall. Within the core of the TTC (the old City) it remained a single zone system. After a one-year blip for the Yonge subway opening in 1954, the fall continues. That’s in town riding, not out in the burbs and farmland. This is the classic fallacy of post hoc, ergo propter hoc. Co-relation does not equal causation. George, I agree… I haven’t had a chance to update my CUTA 2014 GTA OpMetrics. I have updated 2015 for TTC vs. GOtransit only, however. I hope you’ll enjoy the insights George and Brian too—great post: on point, well-organized & concisely written! Brent…GTA Service & Fare integration was the founding mission of the GTTA (Metrolinx predecessor before name change). It was dropped in 2009 (coincidence or design) circa Rob Prichard arriving March, 2009 as its new CEO, taking over from 1st CEO Michael Fenn. TTC refused Metrolinx request in 2010 to test GTA service integration with MiWay/YRT in 2009/10, telling me “It wasn’t worth our effort”; while province successively scuttled any progress on GTA Fare integration until after the 2011, 2014, and no doubt 2018 provincial elections, so the adverse impact on riders, wouldn’t be felt until Job #1, their re-election was achieved (made less & less likely given consumer outrage over sky-rocketing hydro prices). Holy smokes, that’s a whole lot of Latin, good thing my daughter Liana works in and teaches Latin (Indian Jones’s! )…well maybe I’ll use Google Translates this early in the morning, but I get your point, Steve, but on a macro-GTA level many factors did impact (as I tried to suggest—it wasn’t all more/less fare zones, but many (longterm factors) that fueled the almost 30 yr TTC ride rise). I remember you telling me years ago the 5th fare zone went all the way up to Aurora, and, wonder exactly where the other 4 were? Would I be I correct stating 4 zones in (soon to be) MetroTOronto (TO, Etob, NY, Scar?) 5 Steeles, North? Do you have a 1950’s fare zone map in your archive, Steve? I think it would be both educational (me) and fascinating too if you could publish it now, 60 yrs later!!!! Steve: Here endeth the lesson, I hope. There is a selection of maps on Transit Toronto’s site including maps from the 1950s showing the zone system. Zone 5 went to Richmond Hill. I wonder if the “pure” fare-by-distance option came up because TTC told Metrolinx that there was no way in hell they could implement the “hybrid” scheme with the way their system is currently designed (ie. subway/rt backbones to a bus grid). Steve: The “pure” system is even worse. 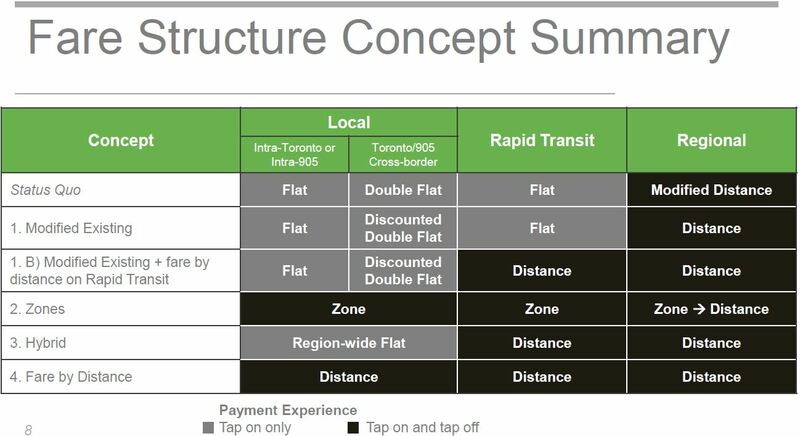 Metrolinx seems to be desperately trying to create a situation where the TTC is converted to a GO-like fare scheme so that “SmartTrack” can use a “TTC” fare scheme that actually matches GO’s rather than the flat fare everyone expects, and on which all demand projections have been based. Steve considers whether all this is to make SmartTrack a viable financial proposition. If so, boy, is the tail ever wagging the dog like crazy!